I often wonder how geography students in Years 7, 8 and 9 are able to grasp different scales let alone the interplay between geographical themes which they will explore further at GCSE and A level. In my attempts to support learning and, in particular, written work at Key Stage 3, I am acutely aware of my over-reliance on the term ‘add more detail’ followed by brief demonstrations indicating how responses might be further developed. So what do I mean by ‘add more detail’? Do I consider my demonstrations a success if I can’t see evidence of them in subsequent pieces of written work? Increasing the number of connectives used at Key Stage 3 by encouraging their use has a clear and positive impact on the quality of written communication. Progressing from basic, standalone statements to clear, connected and thus more coherent paragraphs is one of my key aims throughout Years 7 and 8; developing detailed passages which incorporate key terminology is a focus throughout Year 9. Whilst this may seem an obvious way of preparing for the demands of GCSE Geography, it is often hard to explain to students without real examples from previous sections of the scheme of work and indeed examples of students’ work from previous year groups. I would like to share two techniques I have developed to support Key Stage 3 geographers in their quest to write with better geographical style. Firstly, I tend to refer to written work as basic, clear or detailed – this enables me to level work and offers a simple grading system where students are not aiming for a B (Basic), or a C (Clear), but are in fact encouraged to achieve a D (Detailed). This is an obvious reversal of the A to E grade system used by so many other subject teachers; Key Stage 3 students find aiming for a D grade highly amusing and this often leads to some interesting discussions with parents. With a little explanation in the front of their exercise books, parental complaints regarding D grades can be avoided! In order to achieve a D grade by adding necessary (d)etail, students must demonstrate a clear grasp of key terminology and are expected to make use of all resources available to them: textbook, classwork and our Google classroom stream. Whilst I can point students towards resources, so much of my marking focuses upon what information they have used and how they have incorporated it into their own written answers. To avoid time consuming demonstrations when marking books, I like to refer to magical stepping stones during lessons in order to encourage students to progress from grade B to grades C and D. Stepping stones should be made available to students in their exercise books and on the walls of classrooms and should contain examples of simple, clear and detailed geographical sentences. 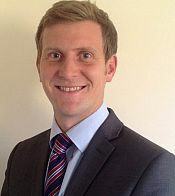 Nick Dyso n is currently Head of Sixth Form at Burgess Hill Girls, and also works as an examiner. He has held a variety of teaching roles during his career, including: Newly Qualified Teacher Coordinator, Head of Geography and Head of Careers. Outside of the classroom, he is also a keen windsurfer.